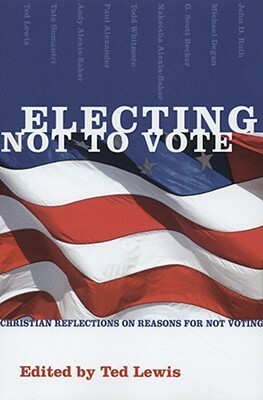 "book reviews", "books", "christian anarchism"
This week, I finished reading Electing Not to Vote, a collection of essays on abstaining from voting edited by Ted Lewis. It was among my pile of Christian anarchist literature that I've been going through, but reading it now is especially timely with the presidential election looming. I would absolutely recommend you read it in the next couple of weeks if you are a Christian wondering weather or not participating in public political life is an appropriate extension of your spiritual life. You can even read a portion of Andy Alexis-Baker's essay about the "Myth of the State As Savior and Elections as Confession of Faith" on Jesus Radicals--HERE. I liked that each essay approaches the issue from a different perspective and offers different reasons for not voting--yet all are united in their goal of remaining faithful to following the way of Jesus and upholding the Church as a people set apart from the world. Part of the reason I liked this approach is that I have such a hard time cogently explaining my position on this question. There are so many reasons! And this book covers many of the best ones--in only 100 pages. I especially appreciated Nekeisha Alexis-Baker's essay (although I wish she hadn't been the only female voice in the book) and how she tied not voting with a freedom to speak politically in other ways. We often are told that voting is how we make our voice heard and "have our say" in government, but this is just not true. My voice and my opinion are far more nuanced than checking "Yes" or "No," and my beliefs never, ever line up exactly with any candidate. And there's no reason for me to restrict it to these methods simply because that is what is offered me by the state. The overarching theme of the book is this: The Church is different. Its rules are not dictated by the state, but by God and God's incarnational love as seen in the life, death, and resurrection of Jesus Christ. And if this is true, then the way we act should look different, and challenge the structures and hierarchies of the world. I'm planning to post more about abstaining from voting on the basis of Christianity next week, when Zack Hunt from American Jesus hosts a synchroblog--so look forward to that if you are interested in hearing more.